I'm so excited about this gorgeous new collection because i absolutely LOVE butterflies. Fluttering Aurora Borealis because I used Swarovski Aurora Borealis crystals on the beautiful butterfly. I just love the sparkle! Other Products: Hot Glue Gun, Sponge, Misti, Big Shot Plus, Scissor, Floral Oriental Cardstock, Swarovski Aurora Borealis crystals, WOW Clear Sparkle Embossing Glitter, VersaMark, ColorBox Mint ink, Pearl White Metallic Cardstock, Pearl White Metallic Text paper, Aqua Lagoon Metallic Card Stock, Pink Azalea Metallic Cardstock, Paper Trimmer, Quickie Glue Pen. Cut a piece of dark aqua designer paper from the Butterfly Dreams Paper Collection 5 7/8” x 5 7/8” and adhere to the 6” x 6” section of the card. Cut a piece of aqua cardstock 5 7/8” x 5 7/8”, cut in half diagonally and adhere to the two crisscross panels. Cut a 5 3/4” x 5 3/4” piece of aqua designer paper, cut in half diagonally, ink the edges with Garden Patina Ink and adhere to the aqua cardstock. Cut two Sweetheart Borders from Pearl White cardstock, sponge with dries clear adhesive and sprinkle with Rajni Chawla’s Crystal Clear. When Dry adhere to the insides of the crisscross panels as shown. Use dries clear adhesive to seal the bottom of the pocket closed. 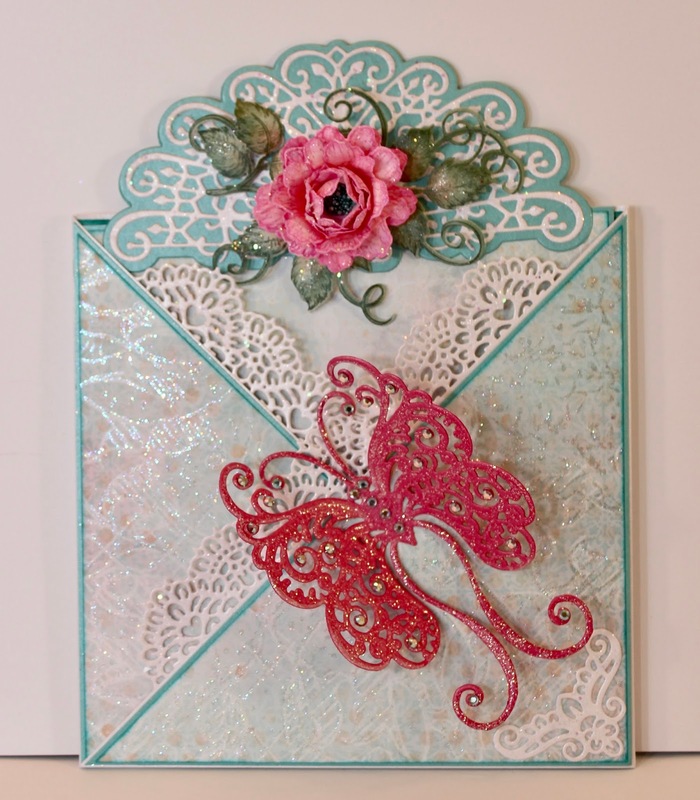 Cut one of the corners from the square Butterfly Kisses Decorative die, sponge it with dries clear adhesive, sprinkle with Crystal Clear and adhere it to the right bottom corner. Use a Quickie glue pen to go over the design in the paper and sprinkle with Crystal Ultrafine Transparent Glitter. To create the pocket insert, cut aqua cardstock 5 3/4” x 5 1/2”. Choose one of the 6” x 6” panels from the paper collection, cut it down to 5 5/8” x 5 3/8”, ink the edges with Garden Patina ink and adhere to the aqua cardstock. Use the Quickie Glue Pen to define the design on the paper and sprinkle with Crystal Ultrafine Transparent Glitter. Cut pearl white text paper 5 5/8” x 5 3/8” ink the edges with Magenta Hue ink, stamp the butterfly and sentiment from the Butterfly Kisses set on the white paper and adhere to the back of the aqua cardstock. 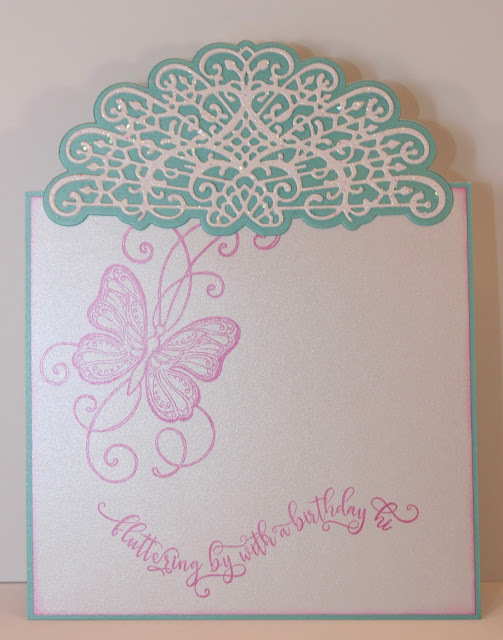 Use the Decorative Medallion outer die to cut two pieces of the aqua cardstock. Adhere them back to back at the top of the insert panel. Diecut two of the decorative dies from pearl white cardstock, sponge with dries clear adhesive and sprinkle with Rajni Chawla’s Crystal Clear. When dry, adhere to the aqua diecuts. Stamp Small Peonies on Floral Oriental White cardstock with Magenta Hue ink. Color with Rose Madder and Magenta Hue ink, diecut using the coordinating dies, shape using the 3D Floral Basics Shaping Mold and finish the shaping with the Deluxe Flower Shaping Kit. Assemble the petals to create one medium flower. Using dries clear adhesive, add Sage Advice Prills to the flower center. 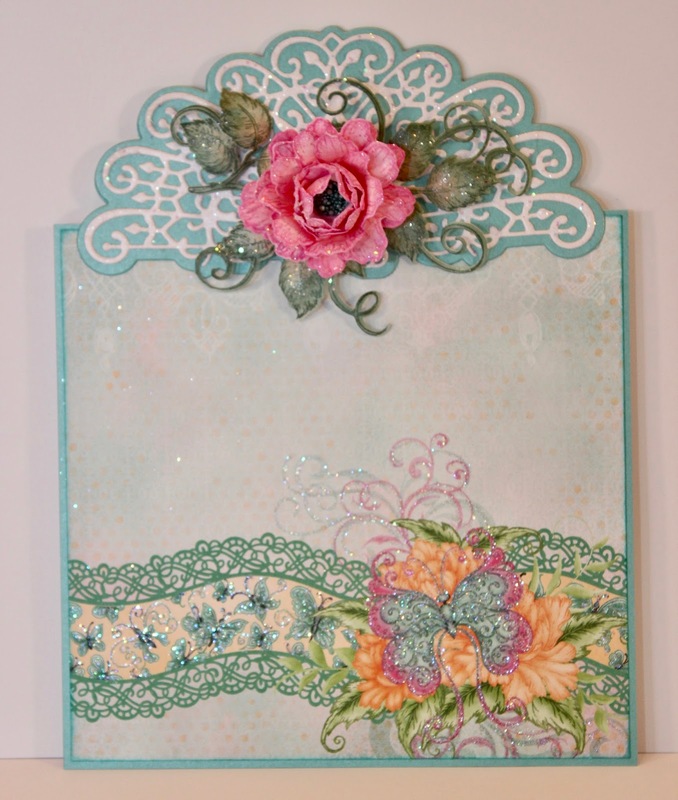 Stamp the Classic Rose Vines on Floral Oriental White cardstock using ColorBox Mint, color with Mint and Rose Madder Inks. Diecut using the coordinating die and add more Mint color around the edges. Sponge the flower and the leaves with dries clear and sprinkle with Crystal Clear. 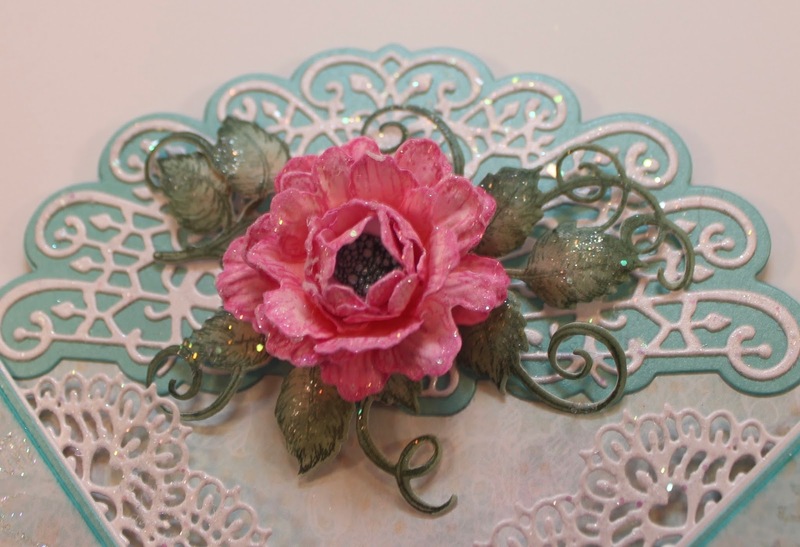 Use the hot glue gun to adhere to the decorative Medallion as shown. 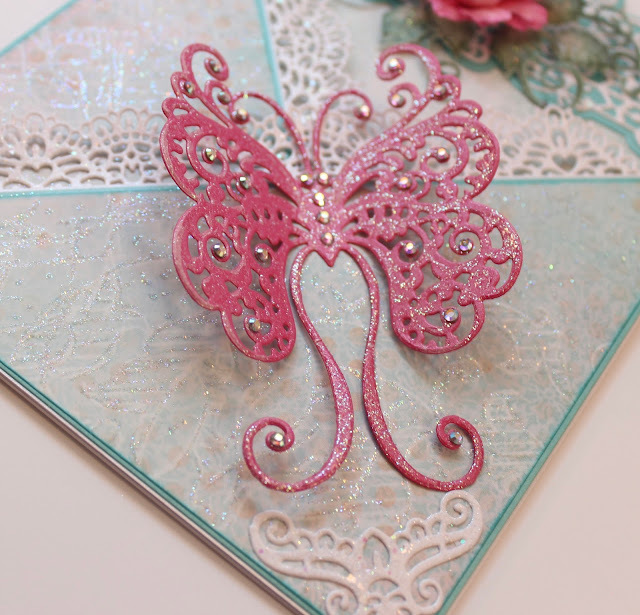 Stamp the Fluttering Butterfly on Pink Azalea cardstock with VersaMark, sprinkle with Clear Sparkle Embossing Glitter, diecut with coordinating die and adhere to the card front. Adhere approximately 25 Swarovski Aurora Borealis crystals to the butterfly. Such a lovely piece! I love all the sparkle! Gorgeous and elegant card. Love the sparkly butterfly. Oh my Janet, this card is just so beautiful!!! ALL sides! I love the pull out and how beautifully the butterfly border looks on it! Gorgeous flower at the top too and everything sparkles so beautifully! Gorgeous sweet friend!